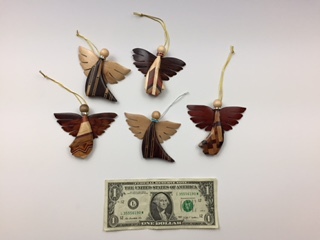 Exotic Laminated Small ornament sized angels with laminated exotic woods. Approximately 3"x3". Assorted body shapes: dancing skirt, foot forward, and triangular and assorted wood combinations. Call for a photo of current availability or let us pick for you.